Just when you think you know what the world holds, something comes out of the woodwork to shake you to your core No, not the terrifying spider scientists taught to obey their commands. I’m talking about something far worse, something we never could have seen coming—even when the signs were there all along. 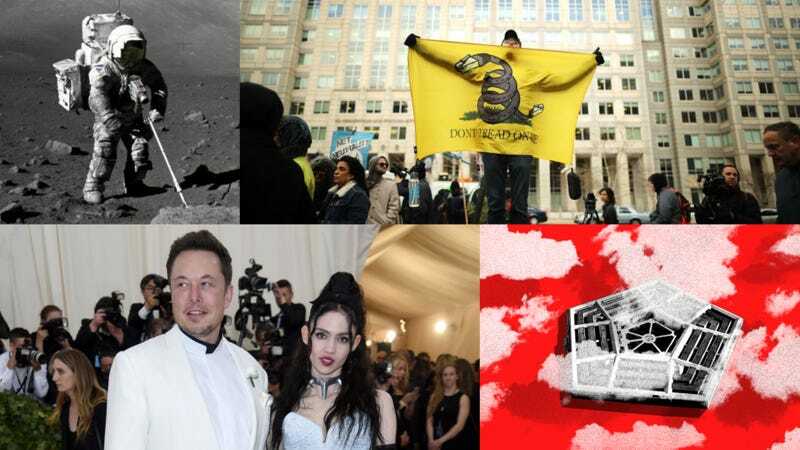 On Monday, reports emerged in Page Six, the tabloid New York Post’s gossip page, that Tesla and SpaceX CEO Elon Musk is dating none other than musician Grimes. At first, I didn’t know what to make of this, because—confession: I had absolutely no idea who Grimes is. But reader, after roughly 20 minutes of research, I have concluded that this pairing is a match made in Musk Heaven. Oculus Go’s VR Is Good and Cheap, So Why Am I Still Disappointed? I’m standing in the middle of my living room, but my view is of the deck of a ship. I can hear my actual dog as he pants on the sofa I pushed against my wall so I could spin my head to explore my virtual surroundings. He’s obscured by the Oculus Go strapped to my face. I take a step forward in my living room, and sigh as nothing happens on the deck. I’d hoped the company would use its first portable headset to differentiate itself from the smartphone-based VR competition—competition that offers a similar experience making cheap headsets designed with your high-end smartphone in mind. The thing is, the Oculus Go doesn’t really stick the landing. Top tech companies are launching a bidding war for a massive Pentagon cloud contract, even as their workforces are pressing them to refuse all military work. In addition to the protests from employees, the bidding process for the Joint Enterprise Defense Infrastructure, or JEDI, contract is bogged down by infighting between traditional defense contractors and the big tech companies that threaten to edge them out of a lucrative business opportunity—and the Department of Defense worries that all of the controversy distracts from its objective of obtaining the same basic cloud computing capabilities already available for consumers, which it says are necessary to better protect soldiers’ lives on the battlefield. By combining satellite radar with seismic data, an international team of researchers has re-assessed the effects of North Korea’s most recent nuclear test at Mount Mantap, offering disturbing new estimates for the strength of the device used and its influence on the mountain itself. Is it going to be called Pumpkin Pie or Peppermint Patty? Or how about Popsicle? Well, whatever Google ends up deciding on, if history is any indication, we’re not going to know for sure until the fall. So to hold us over, why don’t we take a look at all the new updates and features Google showed off for Android at I/O 2018. For Android P, Google is propping up three main tenets: intelligence, simplicity, and digital wellbeing. Though Professor Charles Xavier is a gifted telepath and an excellent educator, he’s also a rather terrible father and all-around menace to teenaged mutants. That last bit never factored too much into Fox’s live-action X-Men franchise, but it’s something that FX’s Legion is very carefully trying to remind us. The delivery mattress industry is booming. Makers of foam wrapped in fabric, like Casper and Leesa, are raking in millions each year convincing people the convenience of an all online and salesperson-free experience is worth it. Generally I am inclined to agree. I feel like I’m going to break out in hives when I make eye contact with a blue shirt at Best Buy or that one lotion man at the mall. But some things cannot and should not be purchased on the internet. And the mattress is one of those things. We’ve long known that moon dust could cause trouble. During the Apollo missions, astronauts complained of sneezing and watery eyes after tracking dust from their spacesuits back into their ships. Scientists need to take moon dust and rocks into account when designing lunar landing equipment because it sticks to everything. No mice or humans were sent to the moon for this new study. Instead, scientists grew both human cells and mouse cells in the lab and exposed both to a simulated lunar dust. In both cases, the moon dust could kill the cell or damage the cells’ DNA. It is also absolutely terrifying.